Red stripes on sides, hood & roof. Black "500" on doors & hood. Red Fiat logo on doors & hood. Red "Firestone" logo on sides & roof. Black & red sponsor logos on sides. Silver door handles & hood pins. This model has Real Riders wheels and its baseplate copyright says 2016. 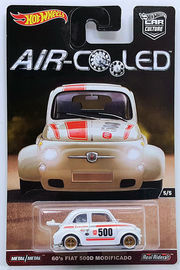 This model won the Model of the Year 2017 award of the Diecast Hall of Fame.